A single bad review may often just be a person who got up on the wrong side of the bed, but consistently bad reviews can point to a systemic problem with a restaurant or group of restaurants. The most often cited complaint online is bad service. On one hand this can be expected as the pay is often too low for employees to paste on a fake smile for long in the face of rude or angry customers. The facade will crumble eventually and when it does a bad review may result. But if it happens more often, a deeper problem may be uncovered. Restaurants often have high turnover. Management and menus change. The restaurant is different from one month to the next or year to the next. But bad online reviews are stuck in time. A negative review of a Carls Jr. location from two years ago is often no longer relevant, yet it will persist in search results, coloring the opinions of would-be patrons. While some reviews can be removed, it is often best to leverage the rules search engines go by to improve them. For example, a major aspect of search engines is something called "freshness". Google began focusing on freshness way back in 2007, but that algorithm has become more important over time. For restaurant reviews it means that new reviews are considered more relevant than old ones and tend to be ranked higher. The bottom line: a constant flow of positive reviews is good for restaurants and can muzzle old bad reviews. There are many kinds of review management software can help with that. Yelp is the biggest pain in the wallet for restaurants without stellar reviews. 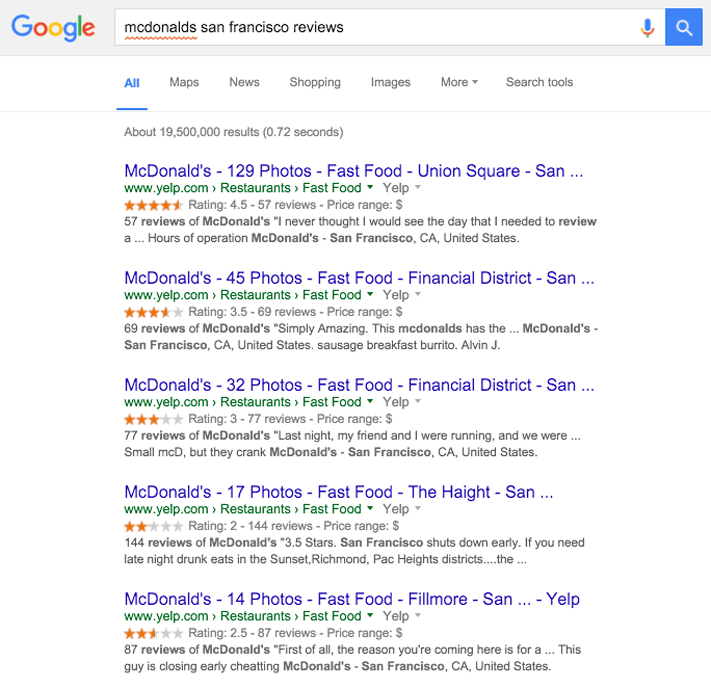 For example, if you Google "McDonalds San Francisco Reviews" the entire page is Yelp. But Zomato.com (formerly Urban Spoon) can affect how people frequent restaurants too. So can other review sites like PissedConsumer.com, Gripeo.com, ConsumerAffairs.com, TrustPilot.com, FourSquare.com, and GrubGrade.com are all players as well. Some of these can be removed under certain circumstances, most cannot. Fast food chains don't normally have OpenTable.com or TripAdvisor.com reviews, so those are two not to worry about. When a searcher drills down to the exact address of a franchise they are often greeted by a Knowledge Graph. A Knowledge Graph in Google is an encapsulation of many different data points that are served up in one place. It includes images, map data, reviews, peak times address and more. The exact ingredients in a Knowledge Graph change for different locations and industries; it's put together by an artificial intelligence-like system. It seems like most local restaurant locations don't "claim" their knowledge graph, which can be a mistake. Claiming a business can add a level of control to what is seen in the graph. A restaurant will want all the control they can achieve as the graph will often show unwanted information. For example, the McDonalds knowledge graph for a location in San Francisco shows review like "Full of homeless people". Ouch! But it may NOT be full of homeless people as the review may be months old. It should be noted that this is a recent review, and that older reviews also complain of a homeless problem in the McDonalds. This is an example of reviews being an early warning system that something is wrong. Good reviews are important for any single location or franchise. Whether it's a Dunkin' Donuts, Cinnabon, or KFC, reviews matter. But they aren't all that matter. Let's take KFC for example as it's pretty typical of the type of search result profile this type of restaurant would have. First, there is a map at the top of search results with a listing of nearby locations below it. Then comes Yelp, a few times. Following that is MapQuest, the KFC store locator, City-data.com, and a menu site. There are a lot of opportunities for bad things to happen in these search results because half of them are review-related, and the others are either unappealing or irrelevant. Now let's look at Super Duper Burgers search profile. It starts with a map, then locations the same way KFC does, but then things start to look better. Yelp is certainly there, all four and five-star reviews. Then their Facebook page, a glowing article in SFWeekly.com, A 4.5-star Zomato.com review, and even TripAdvisor. In other words, they are a fast-food destination. A small restaurant chain normally has small problems. They are nimble, can choose the neighborhood and often the clientele they serve. They can raise their prices, afford different ingredients, and are often the darlings of local media. They're often the first to use attractors like "gluten-free" bread, organic locally sourced beef, and name brand tomatoes. But larger chains are constrained. Menus are decided at a far higher level and for a much more diverse group of consumers. By necessity they are more generic. The more locations a franchise has, the more opportunities for local failure that affects the entire brand. We often see local chains in a dense area are negatively affected by reviews and search results from other franchisees. So when one franchisee doesn't take care of a problem, all of the local franchisees are negatively affected. While processes are in place to remove under performing franchisees the damage has already been done because reviews last forever. They're people, often crazed people, trying to learn as much as possible and execute well. They're following the corporate playbook, and have little room for personal touches. Their bathrooms may be cleaner than the typical franchisee, but in a densely packed environment with other franchisees nearby it may not matter. Often we see unclaimed online profiles that were auto-generated by companies like Yelp and Google. 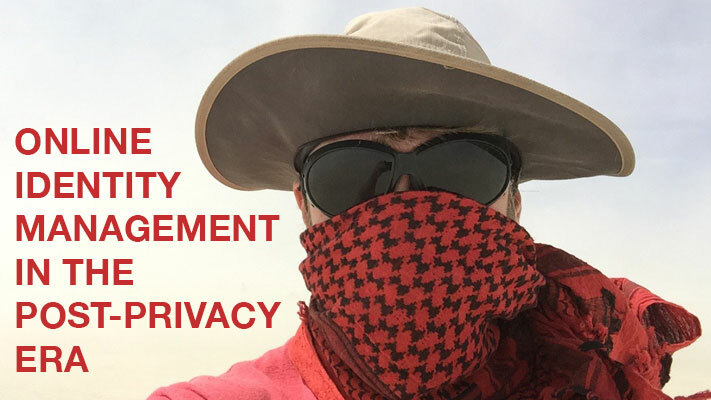 We see a lack of proactive review and reputation management. Images portrayed online are 100% user-generated with no input from the owners. Content is not refreshed and thus becomes stale so that even good news is overrun with bad. Knowledge Graph results are just plain wrong. One strategy that works well for franchisees is reputation management through the local co-op. A group of franchisees in a region pool resources for a long-term online reputation campaign. Costs become very manageable at this level as project management is shared between each location. Sentiment analysis is performed on all locations and the biggest problems are identified. Because one location affects other nearby locations, most franchisees are happy to have the biggest issues dealt with first. With a co-op based reputation management for franchises proactive review management systems are put in place to drive real, positive reviews to the review sites that need them most. Often these are the sites most likely to affect search results. Images are managed so Knowledge Graph and image searches are full of positive imagery which can offset the presence of negative user-generated imagery. Social media sites are augmented with new followers providing what is most often good comments and reviews. Inaccurate information like store hours, location and contact information is corrected for all locations within the co-op. If this seems like something you'd like to consider for your restaurant we're happy to talk. Call us at 800-889-4812.